I understand you completely! I have a huge TBR shelf, yet I keep buying more books. Not even kidding, I have purchased 20 something books in the last two weeks and I am planning another purchase at the end of this month of 10 more books. They are all books I want to read this year though, so at least that’s something. Hopefully I won’t have anymore reading slumps. That really wrecks my reading plan. I’m glad I’m not the only one. I know! I think I might have a problem, but I don’t care. 🙂 Yeah, slumps really mess everything up. Good luck reading all of your books! Thanks. 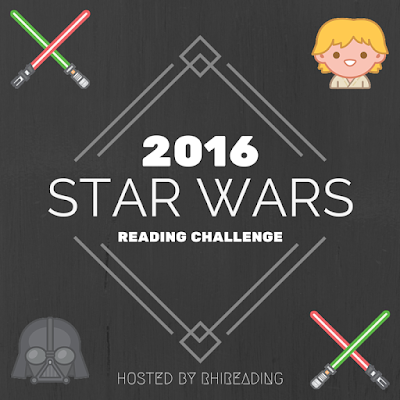 Hope you read lots of awesome books this year! A Discovery of Witches and whole All Souls Trilogy is my all time favorite paranormal series! I higly recommend! Writing is superb and plot is so detailed and thought out. I hope you will love it when you get to read it 🙂 I re-read it every year religiously. The Golden Compass is really good! I read it when it first came out. And then I read the second book when it came out. And then there were three years before the third book came out where I forgot most of what had come before, so I didn’t finish. Maybe one of these days I’ll sit down and read the whole trilogy. The only other book I’m familiar with here is A Discovery of Witches, which I DNFed. After 100 pages of the main character purposefully avoiding checking out a magical book at the library, I got so frustrated and fed up that I abandoned the whole thing. The book itself is a doorstop… and from what I can see, it’s so big because it’s got way too much unnecessary filler. I’m kind of random when I’m trying to decide what book to read next. Usually, I just go with what I feel like… though, this year, I’m trying to concentrate on books that’ll count toward my challenges. I’ve wanted to read the Golden Compass for years! It’s really silly that I finally got it and now I haven’t read it for a few months. I heard that the second book wasn’t nearly as good. Maybe that’s why you stopped. That’s funny because almost everyone today has told me to read A Discovery of Witches. I’m afraid though because I usually agree with the ‘too much romance and filler’ side of things. The challenges are a good idea because then it gives you a goal. I basically have a few books I’m ‘planning’ on and go from there, but library holds and arcs keep distracting me. I know that A Discovery of Witches is very popular, but I am baffled as to why. I guess I just need faster pacing (and/or an explanation as to why the main character was purposely avoiding doing the one thing that would have driven the story forward). I know how you feel. I’m always learning about a new book that I can’t believe I hadn’t read before. I’m glad I was able to contribute. 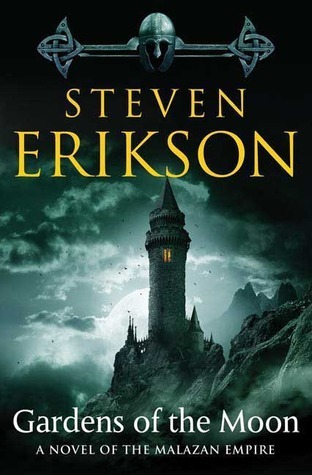 🙂 The Malazan books are said to be really epic with huge battles and magic, but the first book drops you in the thick of things so it’s really confusing. I leave my to-be-read pile stacked up in multiple towers, though maybe I should shelve them properly like you so it doesn’t look as intimidating! Up on that list I have Tamora Pierce as an author in general that I can’t believe I haven’t read yet. Huge oversight on my part, it feels like. I’m too clumsy to have my books stacked. I had mine all over the place, but I decided to organize them last week. I know, I can’t believe I haven’t read Pierce either! She’s been on my list for years. You need to read VICIOUS next! It really is awesome. I also loved A Discovery of Witches, though if I remember correctly it’s on the long side. I keep seeing bloggers talking about Gardens of the Moon, so I’m very interested in that one right now! Good luck getting through your books! I really need to finish the Discovery of Witches trilogy. I’ve only read the first one so far. Great list! Thanks. Everyone keeps talking about Discovery of Witches I really have to get to it already, but I’m so easily distracted. I loved The Golden Compass! 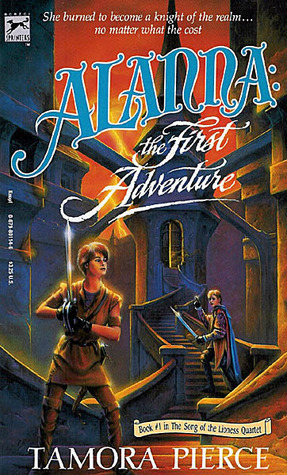 I’d that as one of my favorite fantasy novels of all time. Plus, I loved the idea of having an daemon animal that represented your inner spirit / personality. There used to be a daemon test somewhere online; I forget what my results were back then. I got Neverwhere for Christmas but haven’t read it yet. And like Mogsy, I really should read more of Tamora Pierce’s work. I’ve only read one of her novels so far. I can’t believe I haven’t read the Golden Compass yet. I think that’s the best part, that they have a ‘partner’ animal. I’ll have to see if that test still exists. Almost everyone today has mentioned Discovery of Witches. That’s what I’m afraid about, that it has too much ‘filler’, but I’m going to have to find out what everyone is talking about. 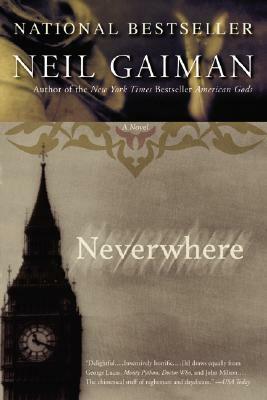 I heard that Neverwhere is good, but not as good as American Gods (which I haven’t read either) I know, it’s amazing how many amazing authors I’ve missed somehow! I bet you would really love A Discovery of Witches. It is a pretty fabulous read rich with historic details and has that paranormal edge that made it even more fabulous! I hope so. 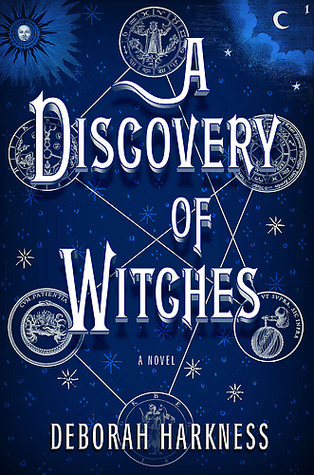 Almost everyone today has read Discovery of Witches, so that’s saying something. I’m glad that you liked it so much. Yes, I definitely have to read it and stop being distracted by library books and arcs. Vicious has been at the top of my to read list for a couple of months, so I’m definitely reading it soon. Though I might read Steelheart by Sanderson first, because I’m finally at the top of the library hold list. Thanks. I hope you have time to read all of the books you want to as well. I also want to read The Red Pyramid, but I don’t own it. I have sometimes had a book on my shelf for years before I read it and I often wonder- why didn’t I read this sooner! Hope some of these make it to your reading pile soon. I usually have a pile of books I’m considering and mood decides which one. Yeah, I got an ereader last year and now my list is ginormous. I didn’t even include all of the books on there today. The Red Pyramid sounds really awesome and I’m a big Riordan fan. I want to read the whole trilogy together, but I can’t find book two for some reason. Wow. 200 unread physical books? Impressive. That is two years worth of reading for me. Impressive or embarrassing I’m not sure which. I can’t seem to stop buying new books though. I remember reading Artemis younger but I don’t remember them. I love Philip Pullman’s series though. Nice list. I think I have 250 physical books too to read. Thanks. 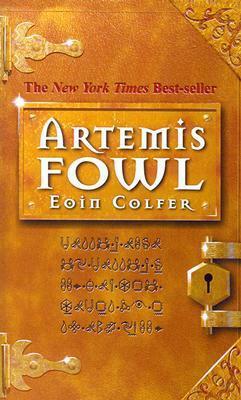 I plan to read both Golden Compass and Artemis sometime this year. I’m glad I’m not the only one with many unread books. Good luck getting to yours. I’m glad to hear it. 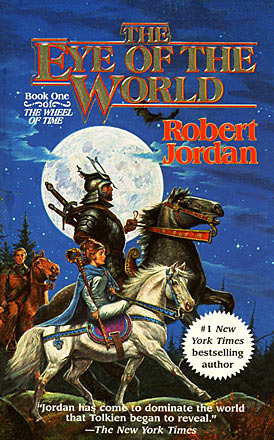 I definitely need to read at least one of the Wheel of Time already! hehe thank you. 🙂 I have a goal this year to read more books my shelves. I was doing well until all of my library holds and arc requests came in at once. I really want to read Mistborn, or just one of Brandon Sanderson’s books. I don’t care which one. I just have to read one because I’ve heard only positive things about his writing. I know what you mean, me too! I think I’m probably going to wind up reading Steelheart first since I’m finally at the top of my library’s hold list. A part of me wants to read Mistborn first, because it was his first big success, but my sister borrowed it, a while ago. I haven’t read any of these, haha. We’re in this together! Nothing wrong with that! There are so many books I can’t believe I haven’t read yet! Wow. 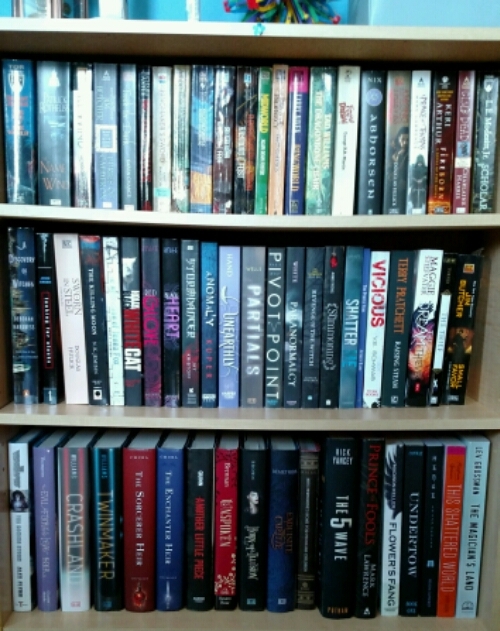 I thought my TBR was bad. Consider me impressed, 200 is a huge number! 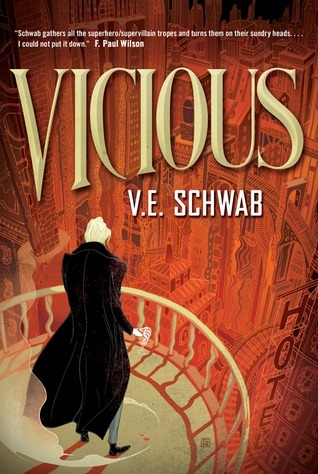 I really want to read Vicious, so I am hoping to obtain it soon. I… haven’t read any of the rest of these either. I do not own them though. I own 160 other unread books, though (not including ebooks). I think we need a support group, no? haha thanks? I’m not sure if it’s impressive or embarrassing. We do need a support group! Congrats on having 160 books you haven’t read! Makes me feel a little better. 😉 I wish we lived closer, I could loan it to you. 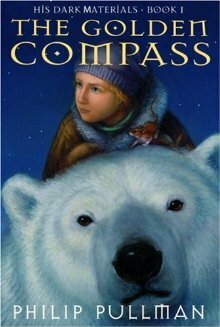 Golden Compass made my list too this week, I really really want to read the series and have owned the first for a long time, I just haven’t gotten around to it yet. 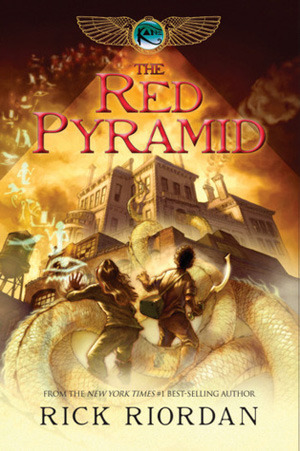 I highly recommend Red Pyramid, it’s not quite as good as Percy Jackson but still really good! I’m definitely a mood reader, so whatever I want to read that’s what I read. Sometimes I try to come up with a schedule, one review copy, then something random, and then repeat. But that never seems to work! I just organized mine last week, so they probably looked exactly the same. Golden Compass is practically a classic, I have to get to it sometime. I don’t have any immediate plans to though. I’m glad to hear Red Pyramid is good! I’m finally going to read it this summer whether I have the sequel or not! Girl! Why have you not read The Red Pyramid yet? I mean, have you seen who wrote it? But yes. Just read the Red Pyramid. It is something you’ll need after the end of Percy Jackson. Because I’ve been saving it! Once I’ve read it it’s over! And I really want to read the trilogy together and I only own books one and three. I’m so reading it this summer though! Hmm, from your list, I’ve only read 4 and 9, so I guess I’m not any better off! It’s so easy to collect books, but so hard to get around to them sometimes, especially if it’s part of an ongoing series where it takes forever for the next book to come out. And there are so many other enticing books out there that just get in the way, and make the list longer. Both of which I can’t believe I haven’t read yet. (Wheel of Time and Alanna) I am most definitely a collector. My problem I think is the books all sound good to me when I buy them, but by the time I get to them my mood has change. (and I might get distracted by new books) I hate waiting for books in a series, which is why I try to wait until they’re all out, but it’s just so hard. 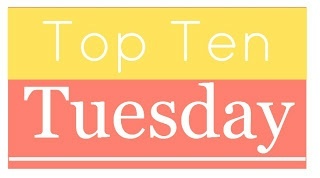 Great picks… I have quite a few on my TBR as well! haha thanks. I’m not sure if it’s mighty or mighty embarrassing, but I will get to them all (most at least) some day! I’m glad I’m not the only one with a rather large TBR shelf. Hahah! Nope, you’re definitely not alone in that! I’m sure more than half of the book-bloggers face the same probs… lol! There’s battles and there’s BATTLES! I just checked out Amazon for Kindle versions, and there is no way I’ve read all TEN to the end. I think I’ve only read three, maybe that is all my library had in stock or maybe I did get sick of the battles. haha yeah I’ve been there too, mesmerized by Terry Goodkind. I’ve heard from my sister that his new series isn’t nearly as good though. It is surprisingly possible to get sick of battles. I’ve found there has to be some differences between the books or action can actually get boring. I have so many books to read that I have lost count! Some I own, some I plan on owning. The His Dark Materials series is one that plan on reading, as is Mistborn. I read Elantris years ago and loved it, and have planned on reading others by Sanderson but haven’t quite got around to it yet.